I know it's still winter, but spring trends are popping up on our fashion radar! So @FrugalFrocks, THE place to find fashion deals and discount codes online, and I teamed up to do a bit of a fashion face-off for another Frugal Frocks Friday post! The challenge? 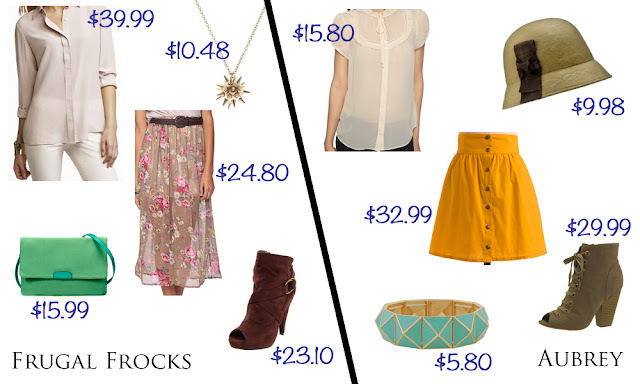 Build a spring look around a statement skirt for around $100! Caro took on the very now sheer overlay skirt with a floral print, while I focused on a bright yellow color and vintage look. Both of us, building outfits completely independently, chose neutral/tailored tops, booties, and modern/bright accessories to keep the looks grounded. Like what you see? Some of these sales end as soon as Monday! Snag them while you can! Lacey, isn't it cute? And the price is very reasonable! Yellow is currently my favorite color. It's been bouncing back and forth between yellow and green for a long time.